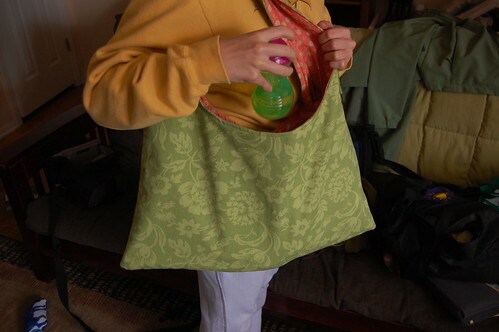 Some of you may know that I started sewing this stupid bag when I was pregnant with Z-cakes. I can't remember the exact month but it's fairly safe to say it was OVER A YEAR AND A HALF AGO. Sheesh. (This is for you Chontal, who once so sweetly said that it looked like I finished all of my projects in such a timely manner-ahem.) Anyway so I fell in love with this bag over a year ago and set to work on it, so proud of the fact that I was going to make myself a diaper bag instead of buying one. Once it became clear that I was NOT going to finish it in time for baby cakes...I copied my friend Neve and just purchased the exact bag she was using as a diaper bag. Why didn't I finish it in the first place? I can't quite remember. I got bored?...I started another project?...oh wait, I'm remembering now. I started having problems with the pockets and the different weights of the fabric. I was getting angry at it and decided to put it away for a while so it could think about what it had done. Unfortunately, I never picked it up again before I had the baby. Everytime I looked at it sitting there I would feel guilty so finally, about 4 months ago I decided to finish it. But I had lost the pattern. I had loaned the pattern out to Rachel and then promptly lost it after she had returned it. So, determined to finish this bag, I bought a new pattern. WHICH I AGAIN LOST WHILE VISITING FAMILY IN IDAHO. (Except this time I just lost the instruction sheet...I still have all the pattern pieces so I can, you know, not know how to put them together). Seriously? Can this really be happening? How could I lose the pattern again? I mean...unless we find it somewhere in Z-cakes suitcase (who is always the last one to unpack by the way) it is most definitely lost in the abyss of my mother's office. 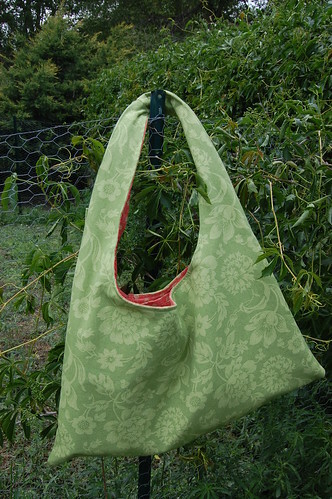 Luckily, I had memorized the last two steps of the pattern so I was able to finish the bag when I got home without the pattern. 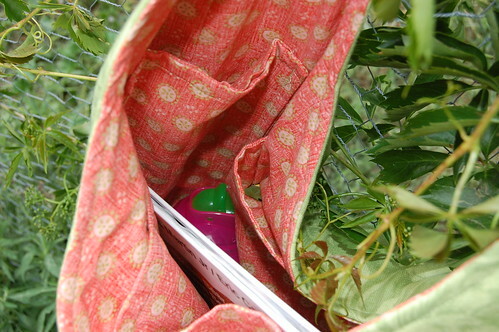 The only consolation in this unfortunate turn of events is that the fabric I picked makes this bag look like a watermelon. At least that makes me happy. This is one sturdy mutha bag. That's probably because besides the canvas lining interior, I decided to buy home decor weight fabric for the outside. I have no recollection of why I chose such heavy material when the pattern calls for medium to light weight cotton. It was pretty? It was on sale? It made the bag look like a watermelon? I don't know...it was like two years ago. So, given the unfortunate loss of yet another pattern, this feels like one of the most anti-climatic finished projects yet. N8t0n tried to talk me down from my near-hysteria by explaining that clearly the pattern did not want to be owned by me, and the universe did not want me to make any more of these bags. But how can I not make more when I own two freakin' copies of the pattern?...or at least I used to. And now, can I even use the bag without something horrible happening? Do I risk putting anything of importance in it for fear the entire bag will up and disappear? What if (heaven forbid) it's not FUNCTIONAL? That does sound like one incredibly frustrating project. But it's done! And it's cute! Too funny! I get almost panicky when I lose my guide sheet. Once, however, I lost one pattern piece--for a weird-shaped facing for a costume. I actually went to Hancocks and asked if I could just trace the piece I needed from a new pattern. Good thing I'm a good customer there!